A Zorro II only graphics card. It was available in 1MB, 2MB or 4MB versions. The RAM on the card is in the form of ZIP chips and can be upgraded if necessary to a maximum of 4MB. The 1MB and 2MB versions used 414256 ZIP Chips, but the 4MB version uses 414400 ZIP chips used in alternating sockets (ie 1,3,5... etc). 80ns RAM generally works, however it used recommended that you use 70ns RAM or faster. The memory on board is automatically detected. However if the Retina does detect an incorrect memory size, or reports an absence of memory, then one jumper allows you to set the wait-state value which may be necessary with faster machines. It has a pixel clock of 90Mhz (8bit). Apprently the Retina Z2 has some sort of AGA compatibility mode, that may allow some programs intended for use with AGA to work, although it's quite slow, particularly with games. The AGA emulation mode also supports HAM-6 and HAM-8 but must be operated in 24bit mode. 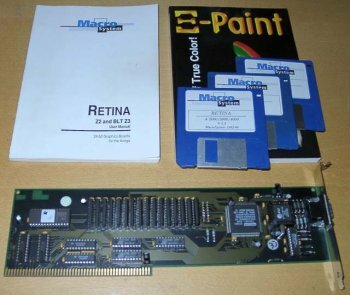 The 1MB version of this can also supports 24bit in 800x600.